One-click conversion of any PDF file into an editable Microsoft Word document! Convert your PDFs into Word documents that can be read and modified in Microsoft Word for easy editing. OCR (Optical Character Recognition) now makes it possible to search for text within images and documents scanned in anyone of 5 languages (English, French, German, Italian and Spanish). Save documents as popular file formats; JPG, TIF, GIF, PNG,RTF etc. Recovers formatted text and images and retains the original page layout. Expert PDF recovers text, images and page format into modifiable Word documents! 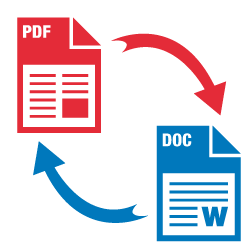 Open the PDF file in Expert-PDF. Click on “Convert” tab in the program’s toolbar. Choose “PDF to Word” as the export format. Click on Convert. If your PDF contains scanned text, Expert-PDF will automatically start character recognition. Name the generated Word file and save it at a location of your choice.